Monitoring the status of important sea turtle nesting beaches in the Mediterranean, against unsustainable development to bring about improved management is an important goal for MEDASSET. 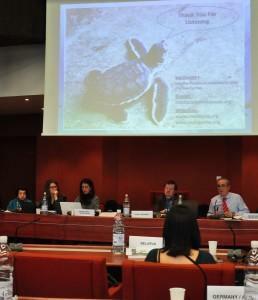 Akamas & Limni: These important green and loggerhead turtle nesting beaches are only protected on paper, as conservation measures are still not in force despite the fact that the beaches belong to the European Union’s (EU) Natura 2000 network of protected sites. 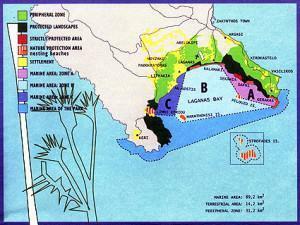 In addition, the habitat in Limni is under threat because the land behind the nesting beach is not part of the protected zone. Following complaints, the European Commission stepped in and there is an ongoing process regarding the inadequate designation of the site boundaries for both Akamas and Limni. 2013 saw further degradation of the sites. 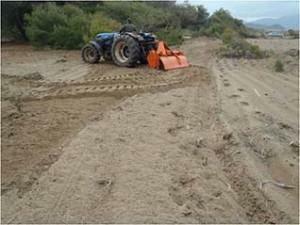 In Limni, NGO Terra Cypria reported sand ploughing during the nesting season. This is the same site where the largest golf resort in the Mediterranean will be constructed. Disregarding objections from NGOs and scientists, authorities recently cancelled the 500 m buffer zone between the resort and the beach, and decided on a 20 m zone instead, with no justification. MEDASSET is working with Terra Cypria to convince the Cypriot government to revoke this decision and implement conservation measures in both sites. 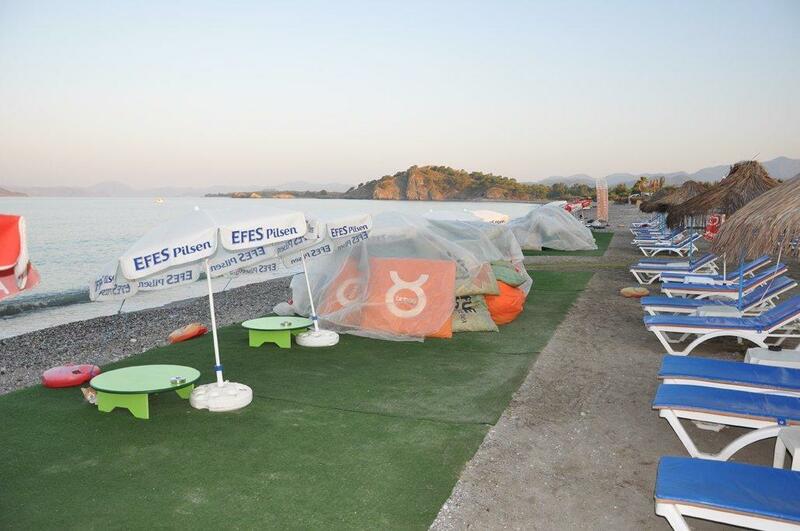 Fethiye: Our campaign to reverse the severe decline in loggerhead nesting in this Specially Protected Area (SPA) continues. In 2013 we documented new businesses that caused more habitat damage and further reduced the available nesting space with unmanaged beach furniture and permanent wooden structures. Longstanding issues of littering, plantings on the beach, motorised water-sports, light pollution, remain unsolved. In the absence of guarding and effective management measures, visitors and vehicles access the beaches night and day. Poorly planned tourism isn’t the only problem in Fethiye. In January 2014, plans for construction of a shipyard directly on the nesting beach have very re-emerged, with locals demonstrating against it. Just as in 2011, we intend to campaign against this project and defend the last pristine stretch of nesting beach in Fethiye. Find out more about the background of this campaign here or download our 2013 report with survey findings and conservation recommendations. Patara: The holiday home construction project (400 – 750 villas) in this Specially Protected Area and unique heritage site, continued despite our complaints. We documented the completion of 27 villas and swimming pools in 2013 within the protected archaeological area. At the same time we recorded several problems on Patara’s long sandy loggerhead nesting beach, such as littering and poor visitor management. Construction of more villas is to commence in 2014: developers report that archaeological authorities greenlighted these despite previous reports of archaeologists that there may be undiscovered antiquities in the ground. Through our campaign we are asking authorities to urgently re-evaluate the scale of the development, deal with the higher number of visitors and adequately protect the habitat against pressures and disturbances that we expect will increase many fold, update the SPA management plan and strengthen enforcement of conservation measures. Find out more about our 25-year “Save Patara” campaign here or download our 2013 report. Another difficult year for the turtles and the Management Agency! In 2013, the operation of the Zakynthos National Marine Park (ZNMP) was reminiscent of 2004-05 when the Management Agency of the Park was unable to perform its basic operational and management tasks, as core funding (deriving mainly from the EU Operational Programme for the Environment) was discontinued by the Ministry of Environment, Energy and Climate Change. Today, the ZNMP is facing the same problems as it did 10 years ago. In this dreadful economic climate and with environmental protection remaining at the bottom of the governmental agenda, a number of violations of the ZNMP rules and regulations were recorded both on land and at sea. Lack of funding lead to the suspension of a variety of ZNMP planned activities and the implementation of management measures in the marine area of the Park until the end of the nesting season. Despite all the problems, during the 2013 nesting season on all six monitored nesting beaches, a total of 4,914 turtle emergences were recorded of which 1,202 were assessed as nests (ARCHELON 2013). The number of nests has been the highest recorded since 2005 and is similar to the annual average of 1,185 nests derived from the previous 29 years (1984-2012) of monitoring. In 2013 the number of dead turtles was significantly lower than the previous 2 years reaching 15 in total (ARCHELON 2013). Three were recorded within the boundaries of the ZNMP and 12 at the eastern coast of Zakynthos. Interestingly, the 3 turtles found dead within Laganas Bay, were apparently predated by monk seals, indicating that predation by this critically endangered species still continues although in a smaller scale than previously recorded. The European Commission in September 2012 took Greece to the European Court of Justice over the landfill site situated within the Marine Park of Zakynthos. It is operating without a permit in breach of EU waste legislation and constitutes a serious threat to human health, the environment, and to nesting turtles. The Commission’s concerns date back to 2009. 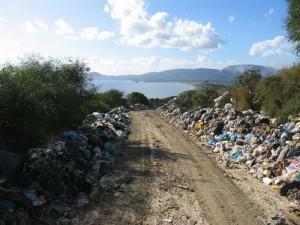 In January 2012, the Greek Authorities were sent a Reasoned Opinion and were asked to take urgent action on the illegal landfill. Inspections carried out in May 2013 by the Special Inspectors Environment Agency of the Ministry of Environment, confirmed that the landfill is still operating in breach of EU legislation. In addition to being a threat to public health and the environment, the landfill is causing damage through pollution from leakages into the local environment, the spread of plastic bags, and is attracting seagulls that prey on hatchlings. Steps were taken to create a replacement facility but serious delays ensued, and no location has yet been selected for the replacement facility. In February 2014, the Prefecture of Ionian Islands, ordered the permanent closure of the landfill, imposed an 18,000 euros fine to the landfill Management Agency and requested for the area’s immediate restoration. MEDASSET will exercise all appropriate legal means to ensure that the illegal landfill will indeed seize operating and that all necessary actions be taken in order to restore the damage this important habitat has sustained all these years. Nesting beaches in South Kyparissia Bay host the second largest number of nests of loggerhead turtles in the Mediterranean after Zakynthos. In summer 2013 nests were more than 1.300 in 3.5 km (ARCHELON 2013). Although the area belongs to the EU Natura 2000 network of protected sites since 2002, the Greek government failed to introduce and enforce the necessary conservation and management measures. In 2012 the European Commission sent a Reasoned Opinion to Greece for its failure fully to protect this very important Mediterranean nesting site. In 2013 the Ministry set up a Special Committee to coordinate all efforts to effectively protect Kyparissia Bay. MEDASSET and ARCHELON are jointly represented in the Committee to ensure that the government fulfills its promises. However, a Special Environmental Study of the area is still pending. Illegal roads (constructed in 2011) were paved, vehicles and tractors were cruising on the nesting beach, sunbeds and umbrellas were not removed at night, lights disoriented hatchlings, nests were vandalized and ARCHELON volunteers were harassed by people working for the construction company that plans to build 50 luxury villas in the area. • Kyparissia – Greece: A Case File* is now open and, describing the situation as “a matter of urgency”, the Convention decided to carry out an immediate “on-the-spot appraisal” of the site in collaboration with the EU. • Fethiye – Turkey: Case File opened. The Turkish Authorities have been requested to report on the situation and react to the Convention’s proposals of assistance. 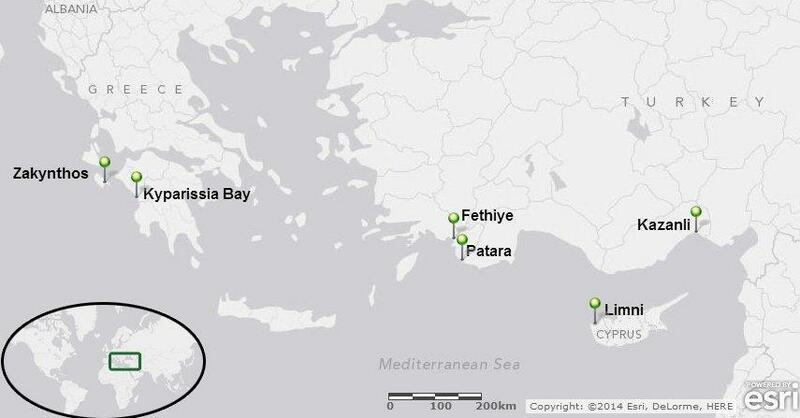 • Patara – Turkey: Case File opened, to be monitored together with the Fethiye case. • Kazanli – Turkey: The conservation status of this green turtle nesting beach will be followed-up again at the 2014 Meeting. Following our complaints about lack of official updates on action taken to address unresolved conservation problems, a short progress report was presented by the Turkish Delegate. Several conservation measures were implemented in 2013, however, illegal beachside buildings and greenhouses remain. Most importantly, in relation to the 1.5 million tonnes of toxic waste deposited next to the nesting beach by a soda chrome factory, it seems there is very little progress since 2010. Only 200,000 tonnes of toxic waste have been treated and the final disposal site is still sought. Click on this link to find out more about the problems in Kazanli and MEDASSET’s advocacy action since 1999. • Akamas & Limni – Cyprus: Case file remained open and the Convention will also liaise with the European Union on the issue. • Episkopi Bay – Cyprus: In relation to our 2010 complaint on high levels of sea turtle mortality (read more here) which was dismissed in 2012, the Convention confirmed its intention to make this the first issue to be addressed through its newly instigated mediation process, but is still waiting for the UK authorities’ response, as the Bay is under the jurisdiction of the UK Sovereign Base Area Administration in Cyprus. Get all the details! Read our 2013 Bern Convention Announcement and 2013 Reports (with photos). *What is the Bern Convention Case File system? Find out here.